Bollywood industry has been blessed with not only versatile and talented actors, but also phenomenal dancing stars. 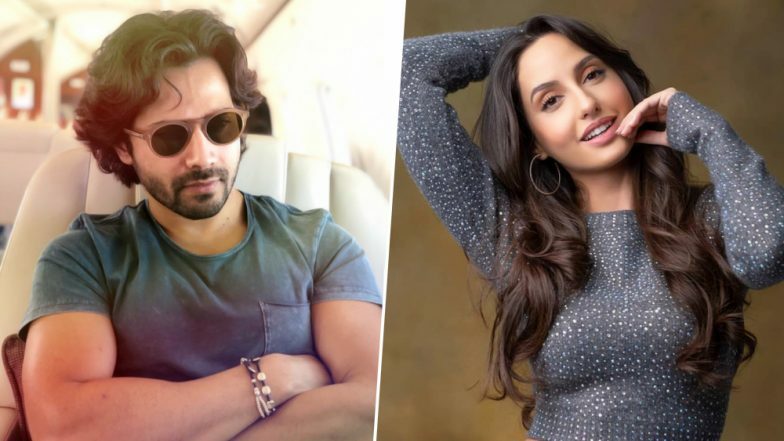 Varun Dhawan and Nora Fatehi are the two marvellous super dancing champs of the showbiz world, who could easily make their way to audience’s hearts, all thanks to their passionate moves! A new video has been circulating on the social web, where we get to witness Varun and Nora shake a leg in a dance-off, and it is a sight to behold! Kalank New Poster: Varun Dhawan as Zafar is Giving us All The Baahubali Feels - See Pic. The Street Dancer actors decided to have dance face-off on Nora's hit number Dilbar from John Abraham- Manoj Bajpayee's Satyamev Jayate. In the viral video, Nora is seen starting the dance with her belly dancing and Varun, being his own self, couldn’t hold back the dancing urge and chips in soon. The other dancers and actors, surrounding the dancing duo, can be spotted cheering for both. A few days ago, Varun had shared another dancing video with Nora. In the video, the Judwaa 2 actor was seen twerking to the beats. Kalank Teaser: These Memes on Alia Bhatt and Varun Dhawan's Poetic Dialogues Are Barrel of Laughs. Varun is currently busy with the shoots of his upcoming dance film Street Dancer 3D, in which Nora is also a part of. Directed by Remo D’Souza, the film was earlier touted as the third instalment in the hit ABCD series. The movie also stars Aparshakti Khurana and Shakti Mohan, with Varun and Shraddha Kapoor in the lead. The Badlapur actor is also riding high with the promotions of his upcoming Abhishek Verman directorial Kalank. Also starring Alia Bhatt, Aaditya Roy Kapur, Sanjay Dutt, Sonakshi Sinha and Madhuri Dixit, the movie is based in pre-independent India. Bankrolled by Dharma Productions, Kalank is slated to hit the theatres on April 17.